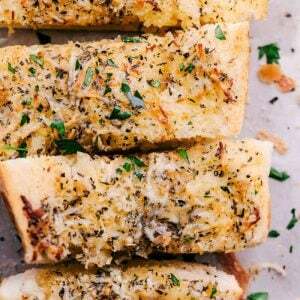 The Best Garlic Bread is an easy to make homemade recipe made with freshly grated parmesan cheese, garlic, and herbs. This is the best recipe that you will ever eat! Preheat oven to 400 degrees. Cut your French bread loaf lengthwise and place on top of a baking sheet. In a small bowl combine softened butter, garlic powder, minced garlic, Italian seasoning and shredded cheese. Spread evenly on each side of the garlic bread. Bake in the oven for 12-15 minutes until butter is melted an bubbly. You can also broil the top for 1-2 minutes at the end to give it a more crisp top.